Get lost in the atmosphere of Melbourne, the city that inspires lovers of culture and sports. Fall in love with the beach lifestyle in Cairns and explore the colourful coral of the Great Barrier Reef. Experience a vast array of desert landscapes as you watch the sunset over iconic Ayers Rock. End your adventure in Sydney, cruising around Sydney Harbour and discovering the iconic sights. International flights: UK - Melbourne, Sydney - UK. Luxury Sailing Catamaran Michaelmas Cay in Cairns, Captain Cook Luncheon Cruise in Sydney. ** Possibility of booking optional excursions in the next step of the booking. Please note that all additional optional excursions which are not selected at the time of booking must be requested before final payment is made at least 60 days before departure. The final price will be shown once you have selected the optional excursions, in the final step of the reservation process. Please note: Michaelmas Cay Day Cruise on Day 6 of the itinerary will not operate from 29th April – 19th May 2019 due to a refit. Another cruise, the Downunder Cruise & Dive, will be offered instead. Arrive at your UK departure airport, ready for a flight to Melbourne. Night on board. Arrive in Melbourne the garden city of Australia. Arrive and take a shuttle transfer to the hotel. We suggest visiting its lively centre to discover its cafes, bars and boutiques. At dusk, we recommend enjoying a delicious Chinese meal in Little Bourke Street or Italian specialities in a trattoria and listen to live jazz in one of the many jazz bars. Overnight stay in Melbourne. This morning, enjoy a comprehensive city tour of Melbourne and cruise on the Yarra River. See Captain Cook's Cottage, Queen Victoria Market, Fitzroy Gardens and Albert Park, home to the Australian Grand Prix. Stroll through the Royal Botanic Gardens, visit the Shrine of Remembrance and see the Southbank waterfront precinct. See some of the city's architecture including St. Paul's Cathedral and the Princess and Regent Theatres before crossing the Bolte Bridge for great views of the city. Finally, enjoy a 1-hour riverboat cruise on the Yarra and end the tour in Federation Square. Make your way back to the hotel on your own. In the afternoon, we recommend an optional excursion to Phillip Island, home to a wide array of wildlife. Overnight stay in Melbourne. Today discover the Great Ocean Road, one of the world’s most spectacular and naturally stunning coastal drives. Take a tour, starting in Melbourne, and enjoy the stunning scenery along the way. Take in all the famous sights of the Great Ocean Road as you twist and snake along some of the world's most scenic coastlines, from surfer beaches to ancient rainforests. Travel through popular resort towns Anglesea, Lorne, Wye River, Apollo Bay and Port Campbell and discover the iconic Twelve Apostles boardwalk, Loch Ard Gorge and Island Arch. Return to Melbourne for an overnight stay. Shuttle transfer to the airport to board a flight to Cairns, known as the gateway to the Great Barrier Reef. Cairns offers all the facilities of a modern city, first-class restaurants, art galleries, botanical gardens, casinos, a marina and a dock where a large number of yachts and cruises of great renown dock. Arrive, transfer to the hotel and explore the city at your leisure. Overnight stay in Cairns. Today, set sail aboard a luxury sailing catamaran for a full-day excursion in Michaelmas Cay, a low lying vegetated sand cay encircled by a spectacular fringing reef, a National Park and a protected sanctuary for migratory seabirds. Enjoy snorkelling in the cay, a fun and great way to experience the many treasures of the Great Barrier Reef and tuck into a tropical smorgasbord lunch. Drift over the myriad of corals and colorful fish. Cruise on the waters in a semi-submersible, seated just one metre below the waterline for a diver's view of the marine life, whilst enjoying an interactive tour of the coral reef. Return to the hotel. Overnight stay in Cairns. Enjoy a day at your leisure to get to know Cairns at your own pace, exploring the local museums and art galleries or simply relaxing. We recommend optional excursions to Kuranda or tropical Cape Tribulation & Daintree. * Overnight stay in Cairns. 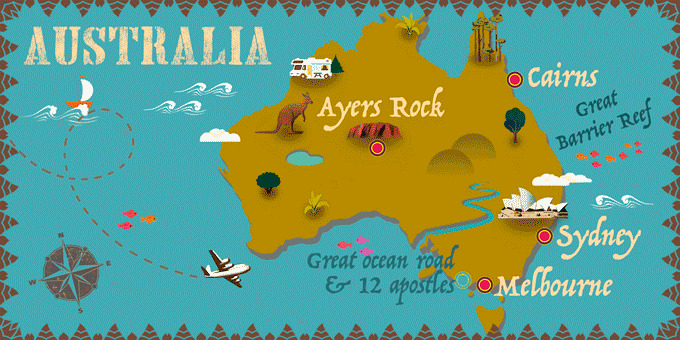 At the indicated time, shuttle transfer to the airport for a flight to Ayers Rock. Arrive, shuttle transfer to the hotel and the rest of the day is free for you to explore this wonderful region, a national park, which aims to keep indigenous culture and traditions alive. We recommend watching the sunset over the Central Australian Desert. Overnight stay in Ayers Rock. Today, enjoy an exciting day of exploration into the area of Uluru and Kata Tjuta National Park using an included Piti Pass, which gives you access to the area around Uluru, the iconic sandstone monolith. Set off early to watch the sunrise, enjoying a warming cup of coffee as the first rays peek above the horizon. Explore Walpa Gorge and its strange rock formations before admiring the tallest dome of Kata Tjuta. In the afternoon, visit Kata Tjuta Cultural Centre, for a great insight into Aboriginal art and the Western Desert region, then travel around the base of Uluru to learn about the native flora and wildlife. Visit ancient Aboriginal caves with rock paintings before heading to a special sunset viewing area to relax with a glass of wine and watch as the sunsets over the other-worldly landscape. Return to the hotel. Overnight stay in Ayers Rock. At the indicated time, shuttle transfer to the airport for a flight to Sydney. Arrive in Sydney, a dynamic and cosmopolitan city that surprises visitors with its mixture of cultures. Transfer to the hotel. Rest of the day free to get to know the largest and most populated city in Australia and Oceania. Overnight stay in Sydney. This morning set off on a full-day exciting city tour and Captain Cook Cruise. Begin by exploring the Manly Beach area and strolling on the shore to see Darling Harbour before crossing the iconic Sydney Harbour Bridge, an absolute highlight of any trip to Sydney. Enjoy views of the Opera House and Harbour Bridge from Milsons Point and head back to Sydney Harbour to board the Captain Cook Cruise. Cruise through the harbour whilst enjoying a delicious buffet lunch and informative commentary about the city. After the cruise, head back to the harbour to enjoy a second city tour, this time visiting the historic Rocks, Hyde Park, St Mary’s Cathedral and Parliament House. Stop at Mrs Macquarie’s Chair for magnificent views of the Opera House and Harbour Bridge and see the colourful Royal Botanic Gardens. Stop at the world-famous Bondi Beach and enjoy the spectacular scenery and the sound of the crashing surf. Return to the city and overnight stay in Sydney. Enjoy a free day at your leisure to explore the different neighbourhoods of Sydney, do some shopping or relax in the harbourside bars and restaurants. We recommend an optional excursion to the North Coast & Port Stephens. * Overnight stay in Sydney. Spend the day at your leisure, sampling the many varied and delicious cuisines of the city or enjoying more sightseeing at the city's many museums and galleries. Alternatively, head to the beach for some well-deserved relaxation. Overnight stay in Sydney. At the indicated time, transfer to the airport for a return flight to the UK. Arrive in the UK and end your trip.